I recently went to a dinner party and was looking for something a bit different to bring. I was asked to bring a salad, and I didn’t want to bring a lettuce salad. My grocery store had some delicious looking fresh organic beets. This beet salad is easy to make, and you can vary what types of oil you use, or even what types of fresh herbs you would like to add. If you are looking for something that is vegetarian and gluten-free, this is the recipe for you to use. Make a flavorful marinated beet salad. Preheat oven to 350 degrees. Wrap each beet in foil and place in a pan. Bake beets for 1 to 1 1/4 hours. Remove beets from oven, and slightly open each foil wrapped beet to let the steam escape from the foil. 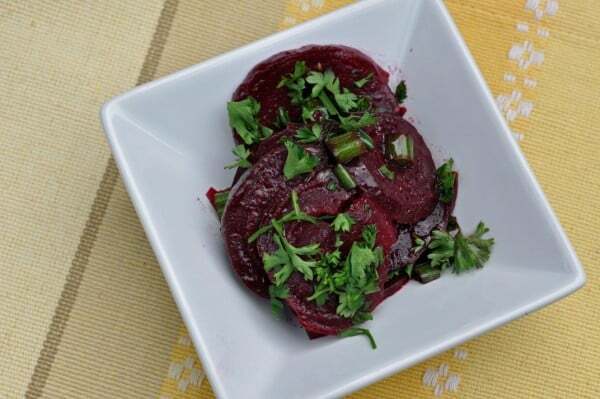 Allow beets to cool for about 20 minutes, or until they are cool enough to handle. Rub the skin off of the beet and then slice the beet to about 1/4 inch thick. Mix together oil, vinegar, and ground cumin and whisk together well. Drizzle vinaigrette over beets and mix together well, be careful not to break beets up into small pieces. Sprinkle over scallions and parsley into beet salad. Season with salt and pepper to your personal preference. My Mom loved this recipe!